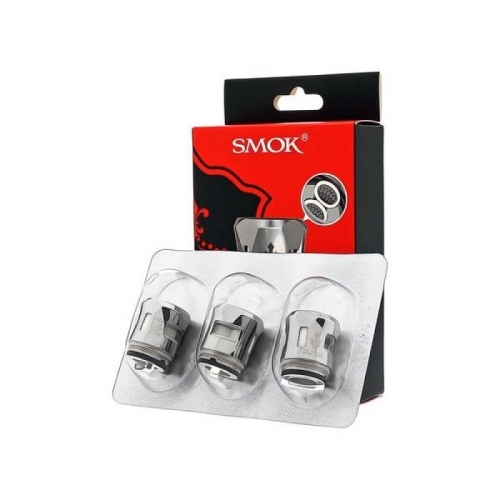 The SMOK V12 Prince Dual Mesh Coil Head is capable of outputting extreme power and efficiency with parallel mesh heating systems and even heat distribution. These dual mesh coils have a larger heating surface area than the standard coil types on the market, which helps prevent hot spots and dry hits. The 0.2 ohm V12 Prince Dual Mesh Coil Head is rated for use between 50-80W but is recommended by SMOKTech at 65-75W. At these wattages, the V12 Prince Dual Mesh Coils show outstanding performance with massive cloud production and rich flavor. For this atomizer head, SMOK used Kanthal mesh material surrounded by 100% Organic Japanese Cotton contained in a superior Stainless Steel frame. Pre-installed inside the SMOK E-Priv 230W TC Kit, you’ll find yourself using the V12 Prince Dual Mesh Coil nonstop. Be sure to pick up a spare V12 Prince Dual Mesh Coil Head so you don’t have to miss a beat. Keep each vape fresh and flavorful with the high performance SMOK V12 Prince Dual Mesh Coil Head.